Peninsula Papers What's On? Bus Services DEFIBRILLATORS Accommodation Village Hall Visiting the Islands Pembrokeshire CC National Park Wildlife Trust National Trust Tide Tables Useful Contacts Contact Us Skomer Boat Info. The church contains a Norman font, a vaulted chancel and transepts with squints from the 13th C. 1874 saw a major restoration of the church which included a new roof and an internal baptistry with steps, designed for baptism by total immersion. This is an unusual feature in an Anglican church and perhaps reflected a wish to counter the attraction of the chapels. There is mention of an earlier church in the area possibly dedicated to St Mary but the exact location is unclear. Read the St Peter’s Church Leaflet here. The church is named after Saint Brigid, the saintly nun who founded many communities in Ireland and it thought to have travelled to Pembrokeshire with Saint David. She may have established a convent at St Brides, the remains of which can be seen on either side of the driveway to St Brides castle. St Brides church, dated from 1291, replaces an earlier chapel and cemetery standing close to the sea, which has now been eroded away. The nave of the church has a fine timbered roof and beautiful windows given in memory of various members of the Kensington family. 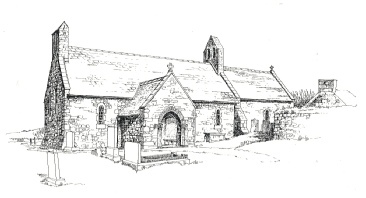 Extensive restoration took place in 2003 and the church was rededicated on St Bridget’s day in 2004. 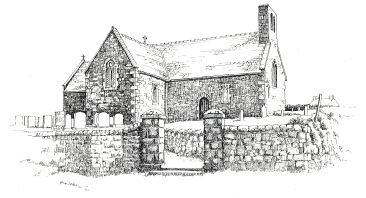 Read the St Brides Church Leaflet here. The chapel was built in 1892 to replace a chapel at the west end of the village. A Methodist chapel was also established in the 19th century but is now used as the Village Hall.